Architects and designers SHH have brought together and led an allâ€star team – including furniture designer Stefan Bench, lighting designers .PSLAB and Chelsea Flower Show doubleâ€gold medallist garden designer Kate Gould – to create two stunning new restaurant spaces within one of London’s greatest 20th century architectural landmarks, the Barbican Centre. SHH answered a brief from the Barbican to make the most of the location within this iconic building envelope, in order to create the new environments, which encompassed both the former 450sq m ground floor café, now a restaurant and shop, reâ€branded as ‘Barbican Foodhall’, and the first floor bar and restaurant â€ now ‘Barbican Lounge’, as well as the outdoor terrace spaces for both venues. 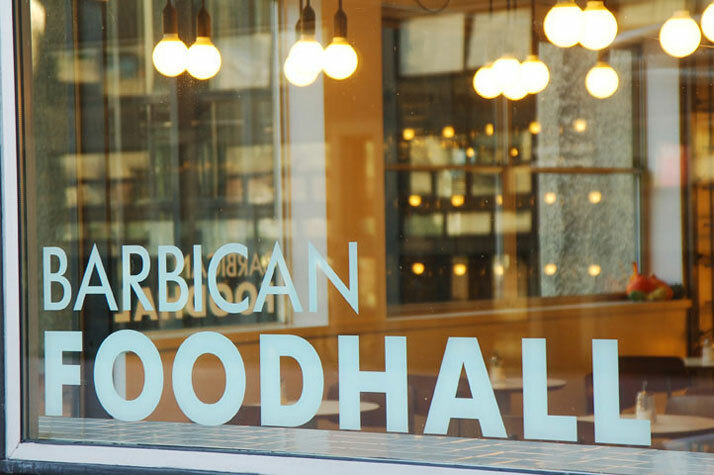 The Barbican Foodhall is a rectilinear space with three glazed sides and an outdoor terrace, now linked more strongly to the indoor space by the use of the same flooring – Cradley red brick pavers – and which looks out onto a row of fountains and the Barbican lake beyond. 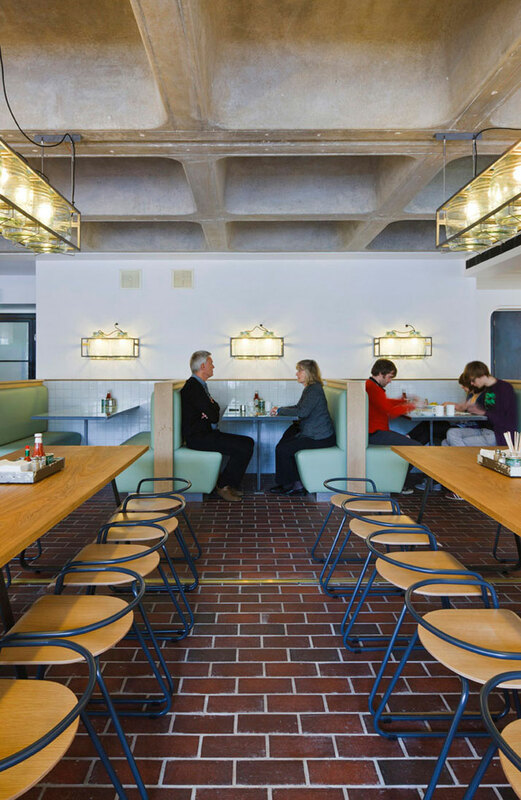 SHH’s overall design treatment for the space features an ‘honest and pure’ materials palette of mild steel, ceramic, glass and brick. Lighting design is a major part of the design mix and the lighting company brought on board by SHH, Beirut based .PSLAB, has created a spectacular siteâ€specific treatment for the project. The result is a testament to a relationship created at a distance between the two companies, with the treatment developed without a single site visit until completion. Light fixtures were conceived to suit the ‘rough’ style of the building fabric and also to abide by the restrictions encountered within a listed building. The ground floor is spatially divided into multiple seating areas by means of low ceiling levels, due to the duct system and various seating layouts. .PSLAB accentuated this division by breaking the space using vertical elements throughout, whilst maintaining the idea of transparency and light. 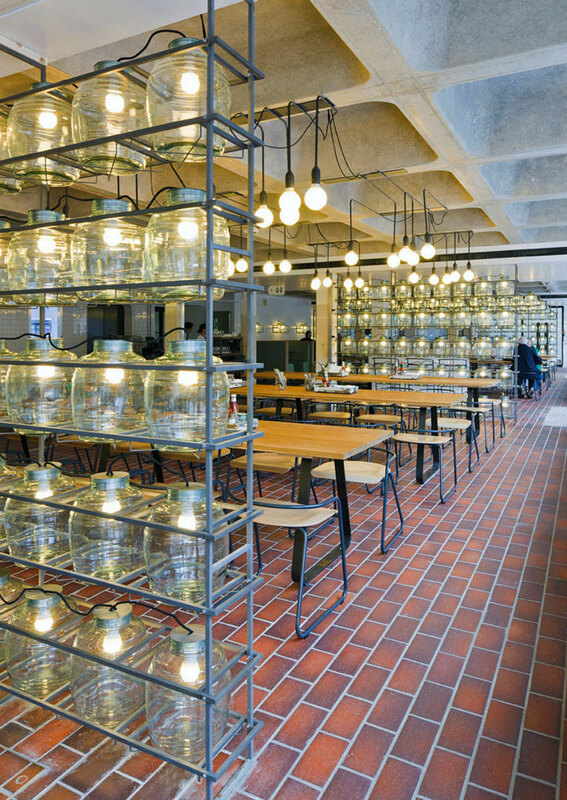 Floorâ€to â€ ceiling shelving structures were developed, holding multiple glass jars housing energyâ€saving light bulbs. The lacquered steel metal structure complements the roughness of the space, using the glass olive jars as a humble reference to food. 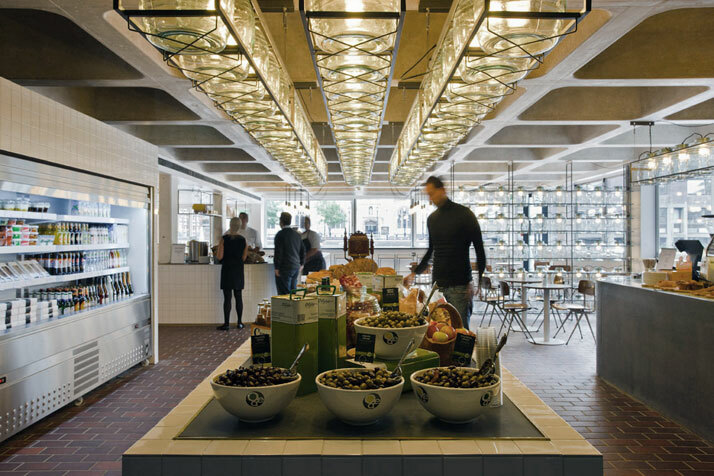 The jarâ€shelving structures were then adapted into ceiling suspended modules to provide functional light. This was concentrated over the cashier and food display counters, as well as the long dining tables. Smaller modules of these shelves were repeated into wallâ€mounted fixtures over the seating booths. 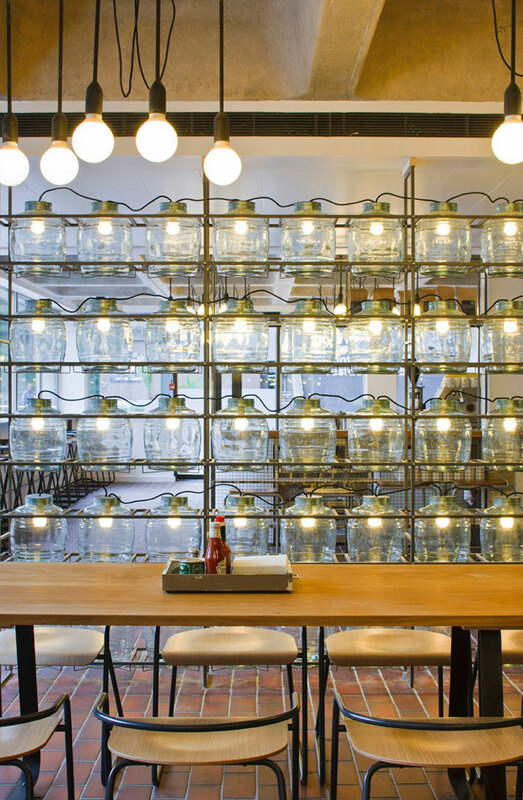 The ceiling fixtures were suspended at a level where the jars aligned with the vertical jar structures, keeping a strong visual link throughout the space. In the two remaining sections, the layout of the tables is consistent with that of the ceiling coffers. Here .PSLAB developed black steel tubes fixed on the coffer edges, extending downwards to shed light over the tables using lowâ€energy bulbs at the end of each tube. As the electrical points are situated inside the coffers, the tubes had to be connected with visible black cables. 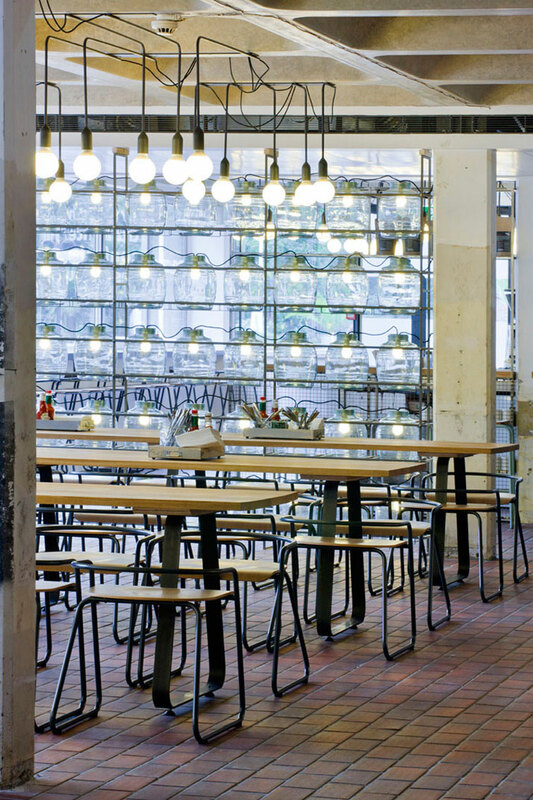 The public space is Lâ€shaped, with the remaining space allocated to backâ€ofâ€house and the kitchen, which is whiteâ€tiled and has an open ‘hot pass’ for customers to see and enjoy the preparing and platingâ€up of the restaurant food. 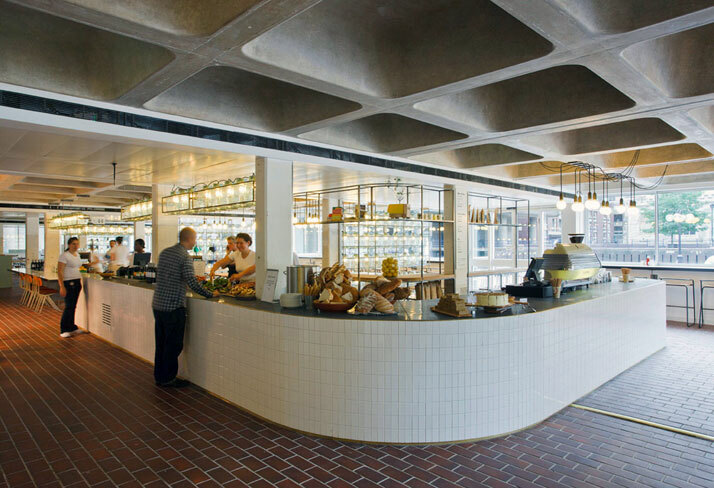 To the left on entry are chilled cabinets and a huge open table to display the deli food offer plus a monolithic curved concrete pay counter, designed by SHH, with a backâ€painted glass top. Behind the counter, SHH sourced vintage Belgian army storage boxes to use as display shelving, along with a rolling blackboard for an ‘old school’ feel. The display table in front of the pay area also features unique vintage items, such as early 20th century weighing scales, whilst miniature wooden trucks from Thorsten van Elten are used to house sugar for coffee or herbs in mini planters. In the main space, diners can sit at the huge curved and whiteâ€tiled deli counter to eat their purchases, or at high counters by the windows, or else at a variety of tables, including a number of 5.2mâ€long solid oak tables, created especially for the project by SHH’s Helen Hughes and sourced and manufactured by Dinesen Flooring, with four triangular, customâ€made black steel legs. Furniture here and in the first floor lounge includes three new chairs bespokeâ€designed for the project in partnership between Helen Hughes and furniture designer Stefan Bench. 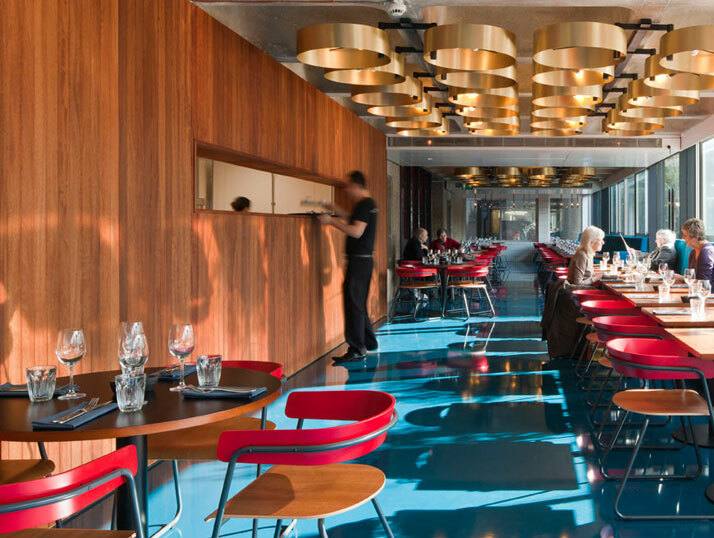 For the Foodhall these include BH01 Low and BH01 High â€ a low and high bar stool â€ and, in the Lounge, a seat with a red back (BH01 Chair) to fit with the Lounge’s daring colour scheme. Additional reclaimed vintage seating represents classic midâ€century Scandinavian modernism. These include stools by designer Nanna Ditzel, some of which had been discontinued since the 1960s and were specially reissued for this project, along with other standard Nanna Ditzel designs To the rear of the space are three semiâ€enclosed tiled booth areas featuring banquette seating in sage green with a solid oak trim and tables in backâ€painted pyro glass (once again for that ‘old school’ feel) with black steel legs. This glass treatment is used several times in the Foodhall, including for the reading benches in the ‘book bank’ area to the rear, where customers can linger and leaf through books (including a great selection of vintage cook books) or bring books in from the Barbican’s library space. The area is ‘announced’ via a feature panel, acting as 3D signage, made up of coverless book spines set in a shelf space above a reading table. The first floor Lounge has material links to its ground floor sister space, but also boasts a very individual and bold design treatment in striking colours, including peacock blue/green banquette seating with red upholstered buttons (using materials from Bute); vintage 60s tables with murano glass tops and a variety of freestanding furniture in blue with splashes of green and red, including a Hans Wegner sofa. The touches of red, which also include the lacquered back panel of the new Stefan Bench/Helen Hughes chairs and a number of vinyl applications to glass panels, all reference Chinese lacquer red, historically used as a reference colour throughout the Barbican Centre. 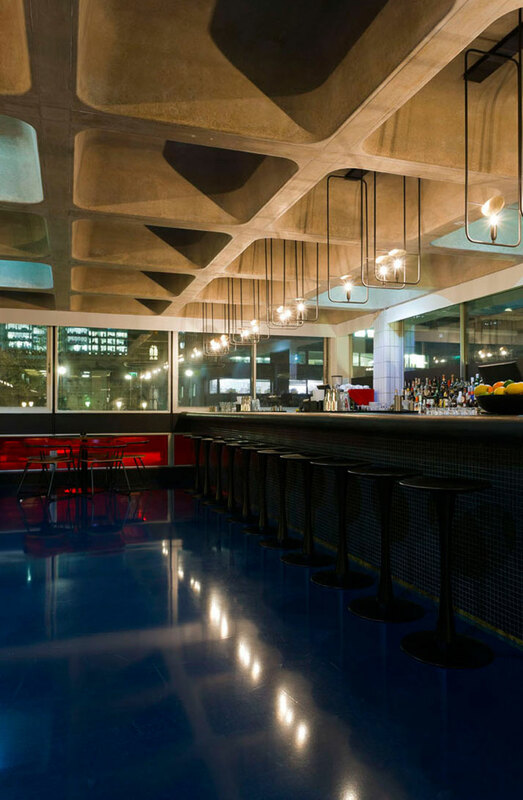 The Barbican’s original hammered aggregate walls have been exposed in this space, which opens up to an outdoor terrace on one side and features two striking indoor walls to the right hand side on entry (the kitchen) and straight ahead (the bar). The kitchen is clad, floorâ€toâ€ceiling, in solid timber, with an open hot pass, whilst the striking 14m bar, which continues through the glazing onto the outside terrace, is in black glass with a black mosaic bar front. Perhaps the most stunning feature of the space, however, is the poured resin floor, also in peacockgreen, created as an exact colour match of a Summer photo taken of the outdoor Barbican lake. Lighting in the space is once again by .PSLAB. 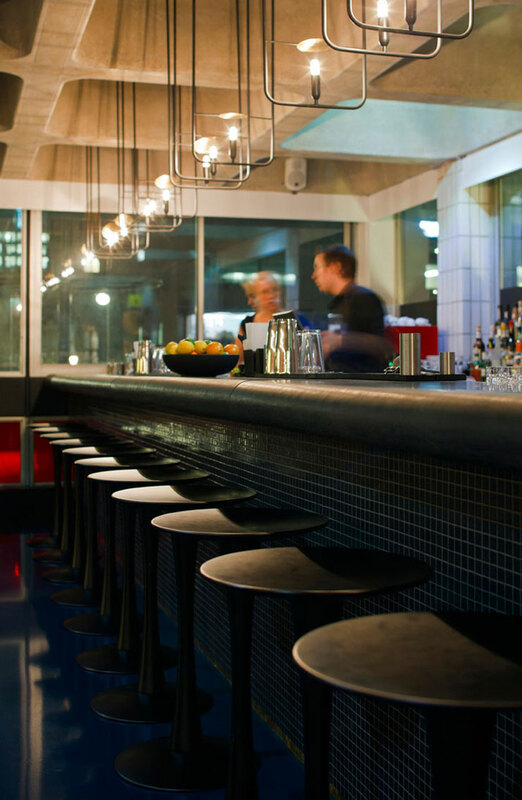 For the bar area, the lighting designers inserted black steel hoops, each carrying a clear halogen bulb topped with a brass circular reflector, so that the brass reflector serves in reflecting and directing the light. The longitudinal perception of the bar is highlighted by the repetition of the hoopâ€like insertions and their reflection in the glass façade of the terrace, acting as a mirror. Over the dining area, .PSLAB developed a series of hoop chandeliers equipped with directional projectors within the fitting, making it functional for the dining space. .PSLAB felt it was important to keep an element of transparency through to the coffers, as the ceiling is such a prominent part of the space. The material of the fixture is hard, in keeping with the spirit of the bar fixtures. The manipulation of the material, however, renders it light in comparison to the ceiling. The finishes are a play between black steel and yellow brass in order to add life to the hoops and provide a contrast to the concrete coffers. SHH’s Helen Hughes commented “The design is made up of a collection of fixtures, which create one overall feature per bay, allowing the coffers to pass by overhead uninterrupted”. The Lounge’s outdoor terrace is linked to the terrace below by four of SHH’s ‘urban tree’ umbrellas. Planting (again by Kate Gould) includes plants that trail over the terrace to mimic the residents’ window boxes (which have always featured trailing plants), and seven large concrete pots featuring olive trees, with lavender at their base, to continue the exotic and strongly coloured dynamic design treatment for this space. On the terrace, object fixation and mounting was only permitted onto the long planter running along the side of the terrace perpendicular to the bar. The position of the exterior lighting elements by .PSLAB therefore along the planter reflected the axis of the mullion on the glass façade. The lighting elements consist of conical heads made from brown folded metal sheets, fixed to stainless steel rods. The detail connecting the head to the rod is a short neck articulation, allowing a multitude of lighting orientations. 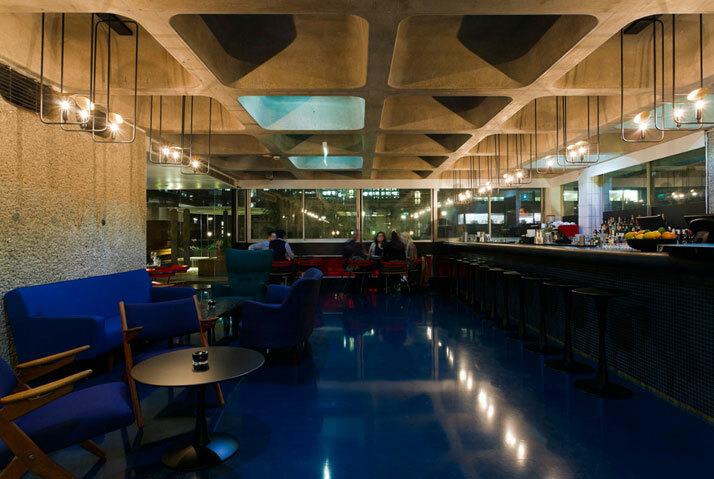 The Barbican is Europe's largest multiâ€arts and conference venue, presenting a diverse range of art, music, theatre, dance, film and creative learning events. It is also home to the London Symphony Orchestra. SHH is an architects’ practice and interior and branding design consultancy, formed in 1992 by its three principals: Chairman David Spence, Managing Director Graham Harris and Creative Director Neil Hogan. With a highly international workforce and portfolio, the company initially made its name in ultraâ€highâ€end residential schemes, before extending its expertise to include leisure, workspace and retail schemes. 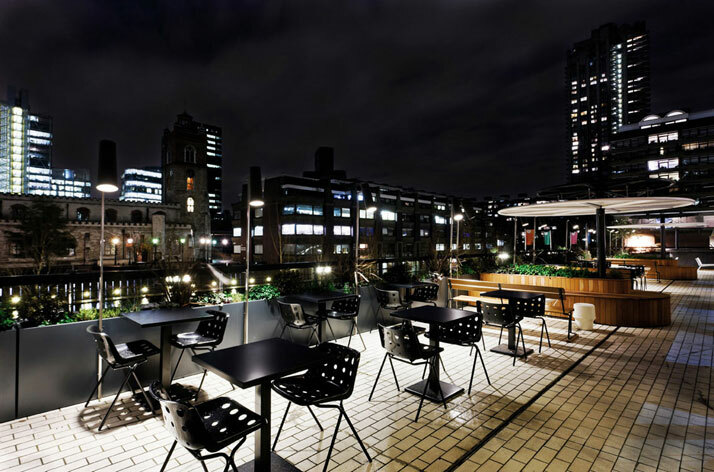 The company’s leisure CV includes McDonald’s breakthrough Oxford Street flagship restaurant, winner of 6 international design awards; new concept Teaspoon tea rooms in Russia; school dining areas for The School Food Trust and awardâ€winning leisure centres for LA Fitness and 37°. SHH’s work has appeared in leading design and lifestyle publications all over the world, including VOGUE and ELLE Decoration in the UK, Artravel and AMC in France, Frame in Holland, Monitor in Russia, DHD in Switzerland, ELLE Decoration in India, Habitat in South Africa, Contemporary Home Design in Australia, IDS in Malaysia and Architectural Digest in both France and Russia, with over 110 projects also published in 60 leading book titles worldwide and over 60 architectural and design award wins and nominations to its name. Chelsea Flower Show doubleâ€gold medallist Kate Gould formed her own garden design consultancy in 1998. Kate and her team are commissioned by private home owners, property developers and commercial clients to create beautiful, imaginative and wellâ€considered gardens, which delight the endâ€user and are kind to the environment. Kate Gould’s real passion is plants and planting. Whilst she came from a real gardening family, she initially started on another career route before the call of her future vocation became too strong to ignore and she switched to garden design. On completion of her studies, she immediately launched her business, which has grown successfully ever since on the strength of wordâ€ofâ€mouth recommendation and, in recent years, in a more highâ€profile way further to Kate’s successes at The Chelsea Flower Show, where she also twice been a category winner, winning Best Urban Garden in 2009 and Best Chic Garden in 2007. .PSLAB, founded in 2004 and based in Beirut, Lebanon, brings together a multiâ€disciplinary team of over 80 architects, designers, engineers, technicians and artisans, in order to exchange, develop and apply ideas pertaining to light. We design, and build siteâ€specific lighting solutions and products. Our work is diverse in type and scale and we have completed several projects in the Middle East and internationally including residential properties, restaurants, hotels, retail stores, yachts, public squares, gardens, art galleries, and exhibitions. We have also been internationally awarded for many of our lighting products. Within our work, lighting fixtures are integral to the general design and not just a layer added at the end of the project. Because we can build our own products, we are free and experimental at all levels of our design process. We are not limited in our imagination and concepts by the fixtures that are available on the market. Building our own products also gives us the advantage of thoroughly knowing their ideal applications and suitability for the desired lighting qualities. So, when our standard products do not correspond to the requirements of our designs, we develop custom products that are specifically adapted to the given constraints. Award winning furniture designer Stefan Bench has been working in the furniture/architecture/ interior design industry since graduating from the contemporary furniture design course at Buckinghamshire University in 2000. Stefan has designed massâ€produced products for a number of furniture manufacturers in both the UK and on the continent, including the 'Quby' modular bookcase for Italian manufacturer Bâ€Line in 2010. Bespoke, project based furniture design is also an important part of Stefan's portfolio and clients include Canteen Restaurants, The Ikon Gallery and Holt Renfrew department stores. Whether designing furniture, interiors or exhibition stands, clarity of form and attention to detail are of the greatest importance in Stefan's work.